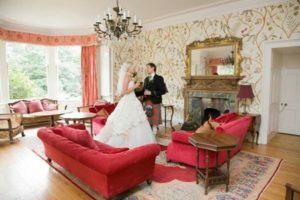 Macdonald Holyrood Hotel Weddings, view this stunning wedding venue in Scotland, including photos, wedding offers and reviews. 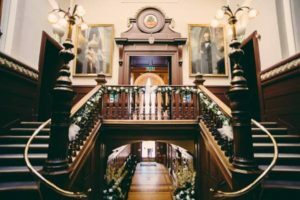 The Macdonald Holyrood offers a superior and exclusive setting for your wedding day. 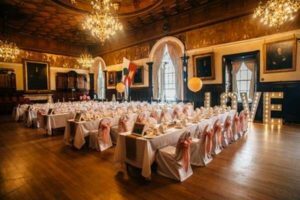 Standing proud in Edinburgh's romantic Old Town, the hotel offers superb facilities and impeccable service that will guarantee you a day to remember. 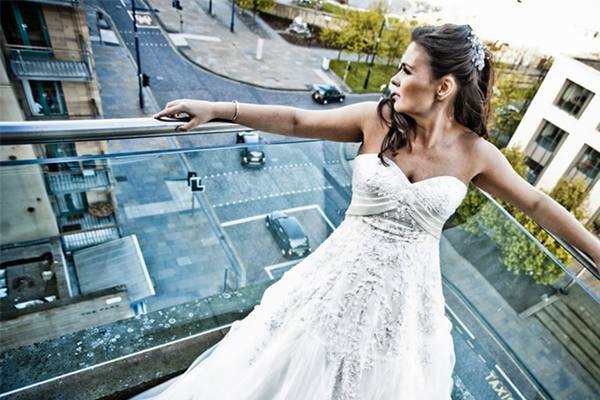 Floor to ceiling windows fill both of our wedding suites with natural daylight from dawn til dusk, giving dramatic views of Arthur's Seat and the Salisbury Crags. Our wedding suite consists of two rooms and its own private bar. 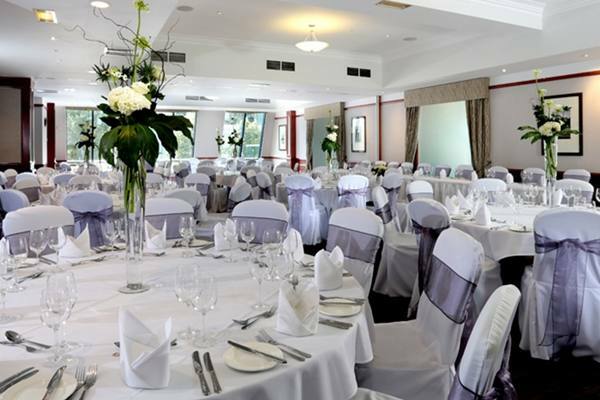 The Holyrood Suite provides an intimate setting for up to 90 guests for your religious or civil ceremony. 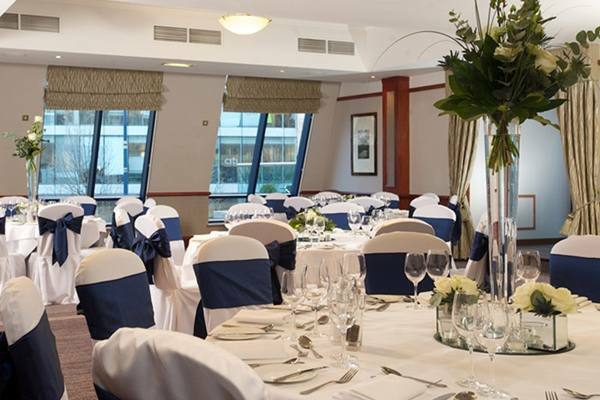 We can also cater for smaller wedding breakfasts of up to 50 wedding guests in this suite. 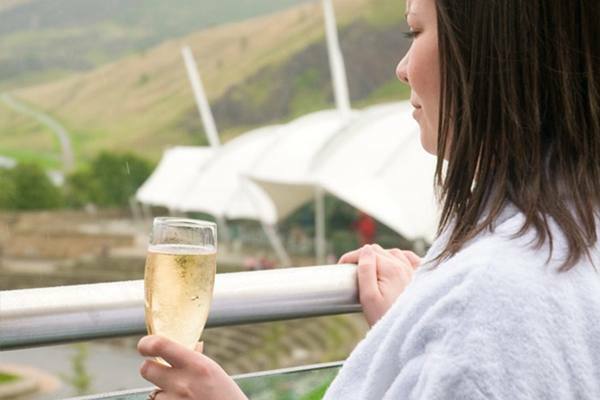 Our main suite, the Salisbury Suite, features a large private balcony with stunning views of the Salisbury Crags and can cater for up to 120 for your wedding breakfast, with up to 160 for your evening reception. All wedding receptions will have exclusive use of both function suites and private function bar, based on minimum numbers and seasonal variations. 1 Bride, 1 Wedding, 1 Day. 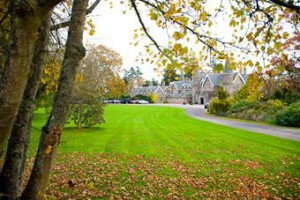 Relax and enjoy your overnight stay at The Macdonald Holyrood in luxurious, comfortable surroundings. At the Macdonald Holyrood there are 156 delightfully appointed bedrooms and all the rooms have en-suite facilities, satellite television, iron & ironing board, hairdryer, mini bar, air conditioning and complimentary mineral water and you can choose between classic rooms, Feature Suites or Club Floor rooms which offer private lift access and a library where a champagne and canapé reception is held every evening. Follow signs into Edinburgh city centre and onto the Royal Mile. 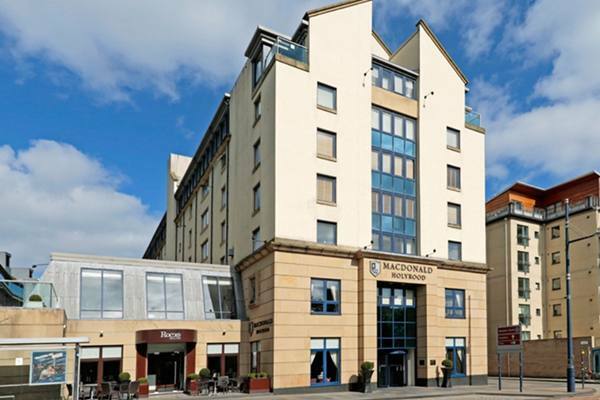 Holyrood Road is situated down from the Royal Mile and the hotel is opposite Dynamic Earth and The Scotsman Newspaper building. Edinburgh Waverly Station – 5-10 minute walk. 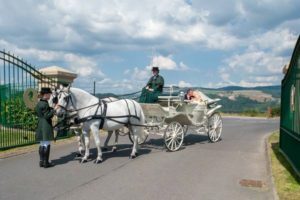 "The staff really pulled out all the stops - with everything from the friendly welcome, room decorations, service and food exceeding our expectations and more. 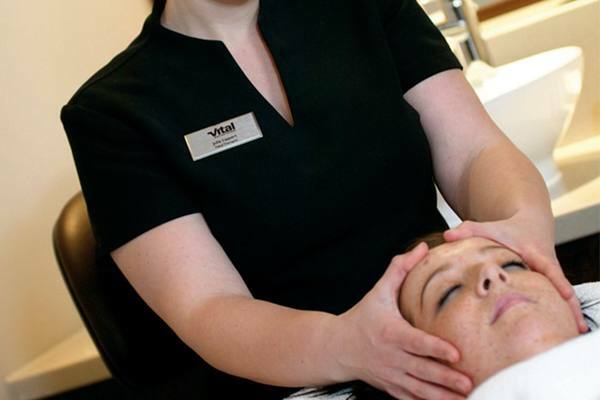 This is without doubt due to the commitment and dedication of the staff members." 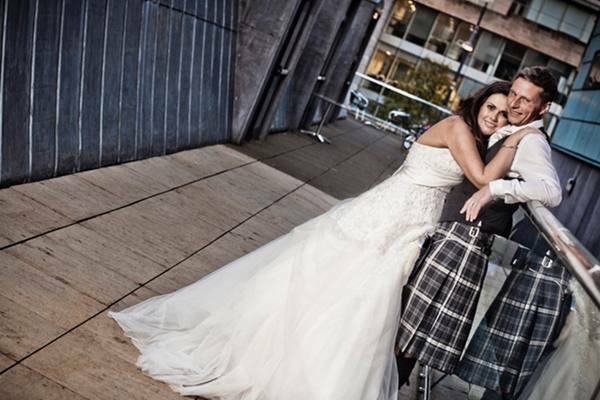 "Thank you to all of the team at Macdonald Holyrood Hotel for making our wedding day and night so amazing! Jodie was brilliant last night, a true credit to the hotel." 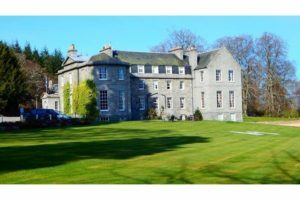 "Would just like to thank the hotel and yourselves very much (Kelly you were so helpful, calm and reassuring on the day). 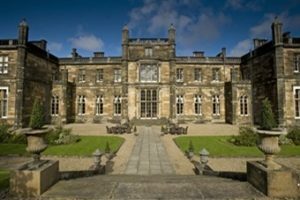 Everything went like clockwork, meal was great and the rooms looked fantastic. A good time was had by all and even the weather was kind to us on the day. So very many thanks one and all." "Thank you and your colleagues for making our wedding day such a special and memorable family occasion. 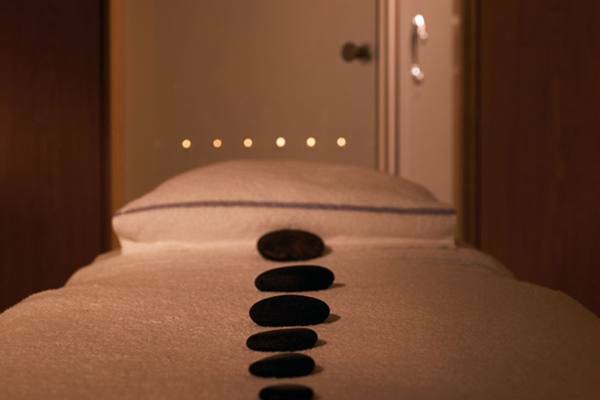 The whole stay was perfect, and the service and attention we all received was exceptional. The Holyrood Macdonald turned out to be the perfect venue for our wedding and we were particularly delighted with the function room and roof terrace. The service at the wedding breakfast and into the evening was excellent and made the day very special." 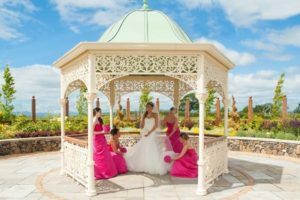 "We would also like to say a huge massive thank-you to you, and all the staff that helped make our wedding so brilliant. You more than exceeded our expectations on how great the day would be. The service and organisation was fantastic, the day went so smoothly we didn't have to think about anything. We have received so much praise from guests. The rooms looked brilliant you set everything out so well. We thoroughly enjoyed the day and would love to do it all again!" "We would like to thank you all for an incredible evening. KH and the team, the set-up was beautiful, the night ran really smoothly and everyone commented on your fantastic service. Zoe, in the months running up to the wedding you were a massive help. Your organization of the entire event and ability to pull everything together was amazing and resulted in the perfect evening. Thank you so much!"